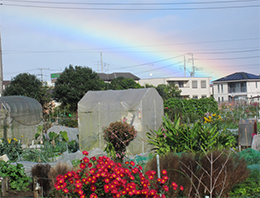 The Association for Japan's allotment gardens now has four local associations, Hokkaido, Chiba (Kanto), Shizuoka (Tokai), and Nagasaki (Kyushu). These local associations are very active. However, we do not have any members organisation in the following areas: in the northeast, in the western part of Japan, and in the Sea of Japan. In Ishinomaki in the Tohoku district, we can rely on a very skilful and devoted person to make contacts with the inhabitants of Ishinomaki and Sendai and the local environmental organizations. He founded an allotment garden to lay the foundations of an organization. He seems to be be doing well and his activities are spreading around. Moreover, he joined the Chiba-ken Allotment Garden Association and qualified as an allotment gardens coordinator. After the Great East Japan Earthquake, he built a flower bed among his various gardening activities, and this helped to support the morale of the victims of the disaster. We support his activity and the evolution in the area and we hope he will be able to create an association in the northeast area. We have already begun talks. Japan's social management is giving top priority to economy. Moreover, in the large cities in Japan, the price of land is so high that it is very difficult to save green spaces such as farmland. Recently, various types of allotment gardens were born in Japan to face this situation. We think that the styles of European allotment gardens which people have cultivated for over a century are a good model. We learned a lot from European allotment gardens and this helped us lay the foundations of our Association for Japan Allotment Garden. This model is also suitable for the climate of Japan. Allotment gardens provide welfare and a good environment for the community and healthy food for the body and mind. We organize lectures that aim at spreading good practice in allotment gardens. 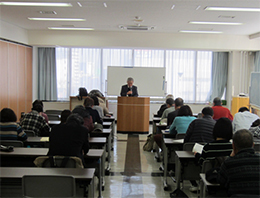 The Chiba local union of allotment gardens invited M. Yoshinori KASUYA to give a lecture last February, and held a study meeting on the theme of "allotment garden and welfare''. On March 3rd, M. Yoshiharu MEGURIYA in Toda City Office in Saitama Prefecture, held "the vegetable cultivation school of the allotment garden." This is a basic training for the new members of the allotment gardens that were created by the city. This training program takes already place for three years. M. MEGURIYA gave a lecture in the auditorium of the Embassy of Sweden in Tokyo in November 2015, on the following subject: "What allotment gardening in Japan has learned from the allotment gardens in Sweden". 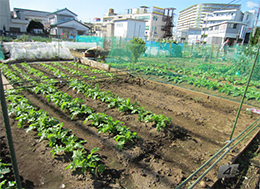 Vegetables are grown, even in winter, in the area of the Pacific Ocean around Tokyo. Potatoes are planted from the end of February to the middle of March. Moreover, whenever there is an allotment gardens organization, a general assembly is held in February. 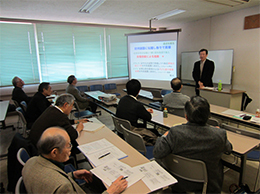 The Chigusadai gardening circle held its general assembly in February. It decided to celebrate its 45th anniversary next year.